Many law enforcement officers are working without pay. Right now, border patrol agents are trying to keep our nation’s borders secure. But when they detain those who cross the border illegally, there is no court to hear their cases, so some are summarily released. Secret Service agents are working to protect our nation’s leaders, but when they travel, they do so at their own expense. FBI and ICE agents are trying to track criminals and terrorists, but can’t pay informants, pay for travel or even cover investigative expenses. Why? America’s government is shutdown, allegedly over border security concerns, with no end in sight. While the majority of federal law enforcement officers would agree that border security is important, and that barriers, technology and a better immigration system are necessary to make our border safe, the backbone of that security is the individuals protecting the border and America. Their vigilance becomes hard to maintain, though, when they are preoccupied with thoughts of potentially losing a home or not being able to feed their family. To make matters worse, and rub salt into already-festering wounds, this shutdown has now become America’s longest, and federal law enforcement officers must come to work without any idea of when they will be paid next. While they show up and their professional support staffs -- analysts, forensic examiners -- sit home on furlough, bills mount, mortgages become overdue and their families get nervous. 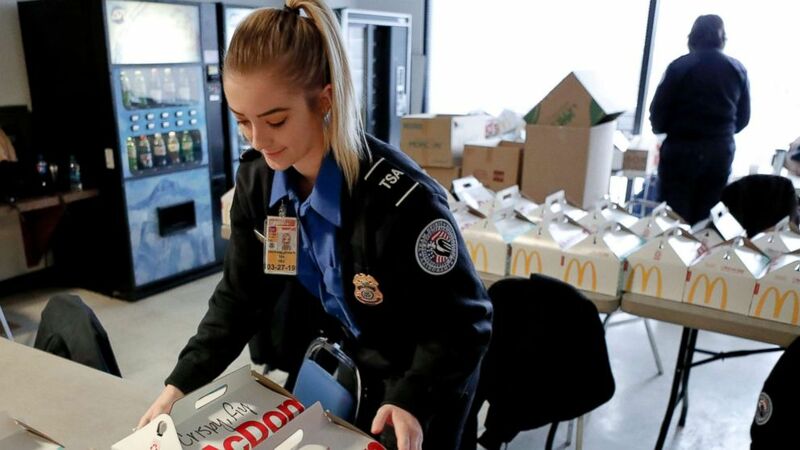 (Keith Srakocic/AP) TSA officer Jenna Erickson, left, helps arrange boxes of meals at the TSA break room, Jan. 18, 2019, at the Pittsburgh International Airport in Imperial, Pa. Because of the partial government shutdown, the restaurant has donated meals to the TSA workers. Federal law enforcement agencies have taken it upon themselves to try to help their employees. The FBI has released a list of food banks and unemployment resources. The TSA has received food and goods donations in various communities. All amounting to a sad state, as our nation’s protectors are faced with accepting charity while working. But many in federal law enforcement are also handcuffed from helping themselves. Secret Service Agents protecting the president and other DHS agents are being told by the Department of Homeland Security that it is unethical to take on another job without receiving approval, or to accept gifts due to their public position. Yet as the over 800,000 federal employees maintain a stiff upper lip, their frustration is mounting. Especially when they see members of Congress taking a trip to sunny Puerto Rico. This trip was allegedly to assess what else the Congress can do to help the Island recover from damage caused by Hurricane Maria. But a photo of recently-acquitted Sen. Bob Menendez of New Jersey on a beach clearly sent the wrong message. Perhaps the best thing members of Congress could have done was stay home and work on ending the shutdown. A government shutdown doesn’t affect the paychecks of sitting Congressmen, though. They have to choose not to be paid. Lucky them. Amazingly, as the shutdown drags on, instead of a sense of urgency to reopen the government, we see more posturing and politicking. This includes calls from Nancy Pelosi to cancel the State of the Union due to “security concerns,” and President Trump's revoking the use of government planes for members of Congress. In law enforcement there is a common thread of selflessness, teamwork and shared sacrifice which is being showcased right now as federal law enforcement officers continue to try and keep America safe with no resources, no support and no pay. It appears our elected officials could learn a lesson or two from our nation’s finest, and come to terms with the fact that despite everything else, it takes people, not politics to make America safe. Donald J. Mihalek is a professional law enforcement officer with over 25 years of experience. He serves as the executive vice president of the FLEOA Foundation and as the FLEOA legislative director.